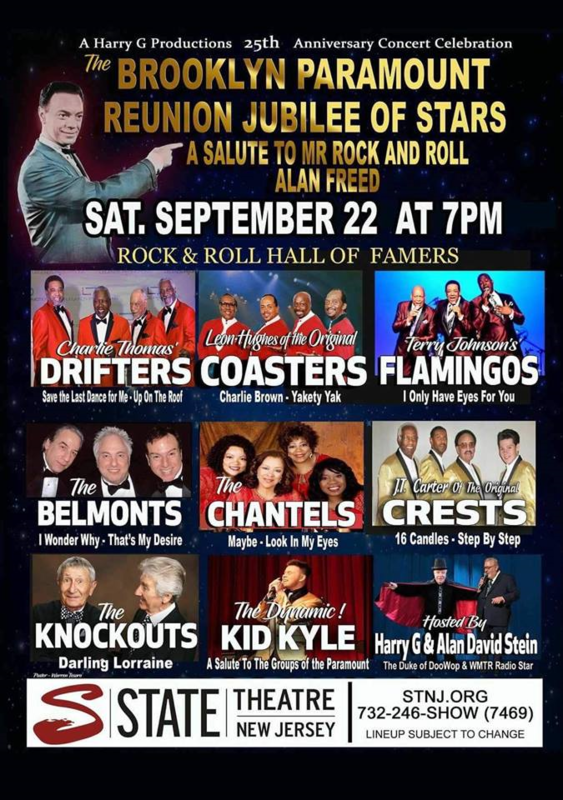 Harry G Productions presents the Brooklyn Paramount Reunion Jubilee of Stars on Saturday night, September 22, at the State Theatre New Jersey, 15 Livingston Ave, New Brunswick, NJ 08901. Concert stars Charlie Thomas’ Drifters, Leon Hughes of the Original Coasters, Terry Johnson’s Flamingos, the Belmonts, the Chantels, JT Carter of the Original Crests, the Knockouts and Kid Kyle. Hosted by Harry G and Alan David Stein. Concert time is 7 PM. For tickets visit www.STNJ.org or call 732-246-SHOW. Tickets are $ 35 – 85.